Deceptively simple, garage doors do more than most homeowners initially realize. In Portland, garage doors are responsible for protecting your car and your home from winter chills, working with the rest of your home to enhance its curb appeal, and providing a reliable entry and exit point for your home. The best garage doors will do all of the above; the worst may do only one (and they may do it poorly)! There are several things to consider when installing or replacing garage doors; Portland homeowners who want to get the most from their money should know both the benefits and drawbacks of particular materials, and have some knowledge of which characteristics make the most sense in a particular situation. For many homes in Portland, garage doors are not only protecting the items inside the garage, but inside the main house, as well. When installing a door on an attached garage, the two most important things to consider are insulation and security. If your new door lacks insulation, your home could be infiltrated by cold winter weather; if it is not secure, you could be faced with a lot more than higher energy bills! It is a fact that many burglars gain access to the main house through attached garages, so in addition to getting a sturdy door that locks securely, make sure that any garage windows can also be locked! Unattached garages are still likely to contain a few valuable items (your vehicle among them! ), but since they won't provide an entrance to the main house, they are less likely to be attractive to intruders. Additionally, unattached garages that are used primarily for parking and storage don't always need to be even moderately insulated. These factors allow for a bit more wiggle room when it comes to the door you choose; you'll be able to either focus your funds on a more attractive door or on a higher-end opener. Four materials make up the overwhelming majority of all Portland garage doors, and each material brings something different to the table. Though many garages can be fully functional when fitted with any of the following materials, it is very likely that one is likely to stand out as the most appropriate for your particular situation. Wood Doors: The top-tier of garage doors, wood is beautiful, strong, and offers superior insulating quality. They are the least cost-effective, however, as they aren't cheap and won't last as long as the alternatives. To accommodate the weight of wood, you may need a screw-driven garage door opener. Steel Doors: Stronger and more secure than wood, these doors will also last quite a bit longer, too. Prices may vary, but are often in the same neighborhood as wood. Obviously, these doors will need to be stainless steel or otherwise treated to avoid prematurely rusting. Aluminum and Fiberglass Doors: In general, these are the most economical garage doors. Each offers a good balance of durability, affordability, and good looks. Both aluminum and fiberglass should be supplemented with some sort of insulation if they are installed on an attached garage. Selecting one of these doors can often make the extra room needed in your budget for a high-functioning and dependable garage door opener. One thing that applies to every garage door installation is home security. You don't want your garage door to be the weak link in an otherwise strong chain of home security. Too often, burglars can find their way into your home through the garage. While the material and design of your garage door will play a part in how secure your garage door is, a poor or faulty garage door opener is more frequently the culprit. Remote controlled garage door openers that work on a fixed frequency are not difficult for even moderately knowledgeable burglars to crack. No technology is 100 percent secure, but modulating garage door openers are exponentially more difficult to get around. There's no way to tell how much your exact project may cost without talking to contractors about exactly what you want. Still, you can plan ahead on budgeting for the project by knowing some broad averages in garage door costs. While HomeAdvisor puts each and every contractor through a rigorous 10-step screening process, you'll still want to solicit estimates from several of our contractors to ensure you're getting the best quality work for a reasonable price. Comment: The locking mechanism on the door won't latch. 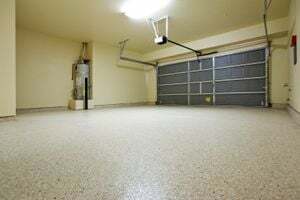 Comment: I would like to get an estimate for Garage with a concrete floor. Comment: Getting ready to pull out my collapsing garage and build a new one. Concrete pad needs to come out too. Home was built in 1922 and I want the new garage to look appropriate in design for an old home. Portland Garage & Garage Door Services are rated 4.81 out of 5 based on 1,526 reviews of 54 pros. Not Looking for Garage & Garage Doors Contractors in Portland, OR?